You can watch the video (2 mins) or read the transcript below, as per your choice. 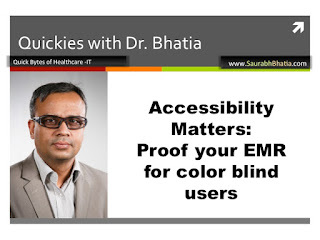 Q: A customer's RFP asks if our EMR has accessibility features for colour blind clinical staff. What features should be built for complying with this? Colour indicators: retain them. We don't want to throw the baby out with the bath water, after all. Smart use of fonts and line weights: bold fonts and thicker borders can catch the eye equally well. Meaningful and consistent use of Icons to indicate abnormal status or result, or a break in the workflow. 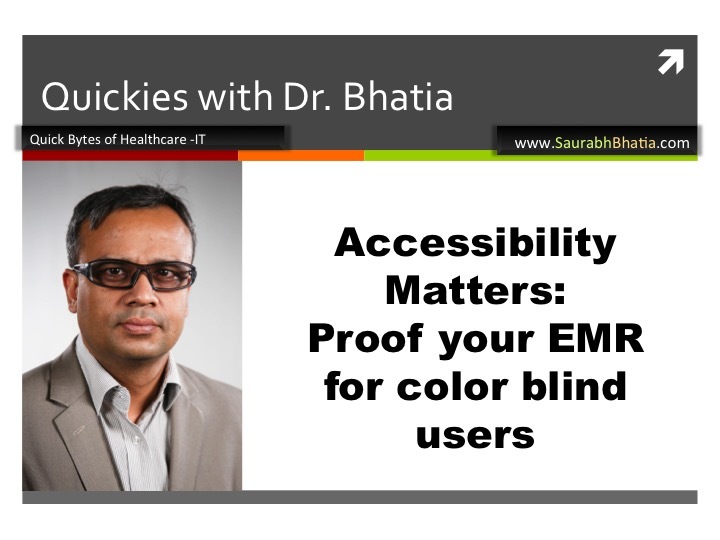 Overall if you use these three indicators then your software would be accessible to those who are color blind or colur sensitivity challenged. Lastly, it may also make sense to test your software and see how will your GUI appear to a color blind person. You can check how the screens will appear to colorblind people by uploading your original screenshots at vischeck.com and seeing how the screens look.